For registered ponies in grade JD & JC which have not won a total of 300 points to be ridden by Junior members, ages as per Rule 77.12/77.13. The first 8 ponies qualify, but they must jump clear in the first round. Qualification does not pass down the line. There will be dual qualification of double clears for the Pony Discovery first round. Qualified riders need to register their details at www.bluechipchamps.co.uk to receive a Championship schedule. Please note that the status of each venue is provided by the show director for that venue. The Blue Chip Championship cannot be held responsible for any inaccurate information displayed above. Pikeur was established over 60 years ago and has an unrivalled global reputation for riding clothing of the highest quality. Many of the world’s top riders and national teams chose Pikeur because of its superb fit; performance; and contemporary fashion and style. From the same stable as Pikeur, Eskadron has driven the “matchy-matchy” craze, co-ordinating horse; rider; and even dog with matching outfits. 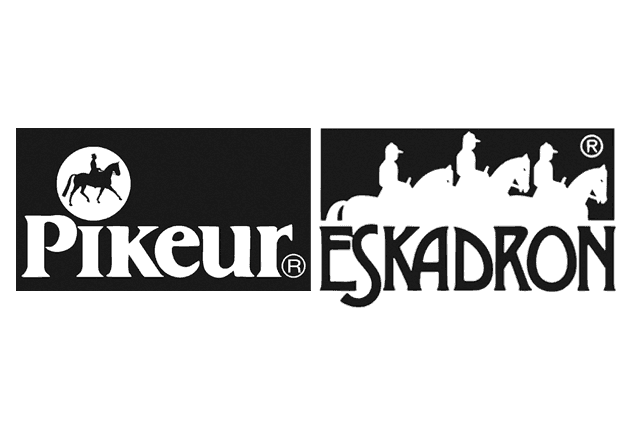 Whilst Pikeur is the world leader in rider fashion, Eskadron leads the way for horses in vogue!